Cindy McCain Floated As Husband's Senate Successor - Joe.My.God. Sen. John McCain held his seat in the Senate for nearly 32 years. After McCain’s death Saturday, it will fall to Arizona Gov. Doug Ducey to name his successor. State law gives Ducey, a Republican, the power to fill the Senate vacancy for the next two years, until a special election in 2020 for the right to complete the final years of McCain’s term. The seat will then be up again for a full six-year term in the 2022 election. Arizona law also stipulates that the appointee must be from McCain’s party. 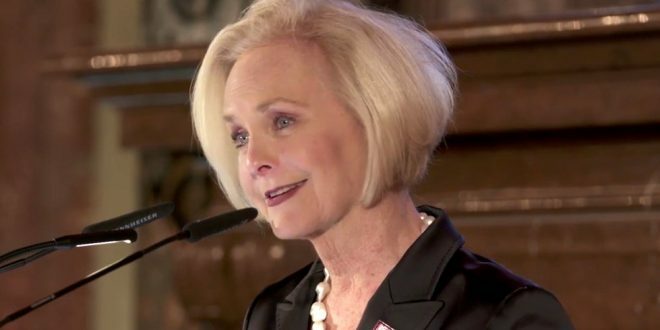 The name most widely cited as a potential appointee is Cindy McCain, the senator’s wife. Ducey and his wife spent time with the McCains in May, which fueled speculation about a potential appointment. The Arizona Republic on Friday also cited as potential appointees Kirk Adams, the governor’s chief of staff and a former state lawmaker; Barbara Barrett, a businesswoman and former gubernatorial candidate; and former Sen. Jon Kyl, who retired from the Senate in 2013.